Water Leak is signal for you to do ceiling repair. Sometimes it’s obvious that you have water leak, either behind your walls or in the ceiling. 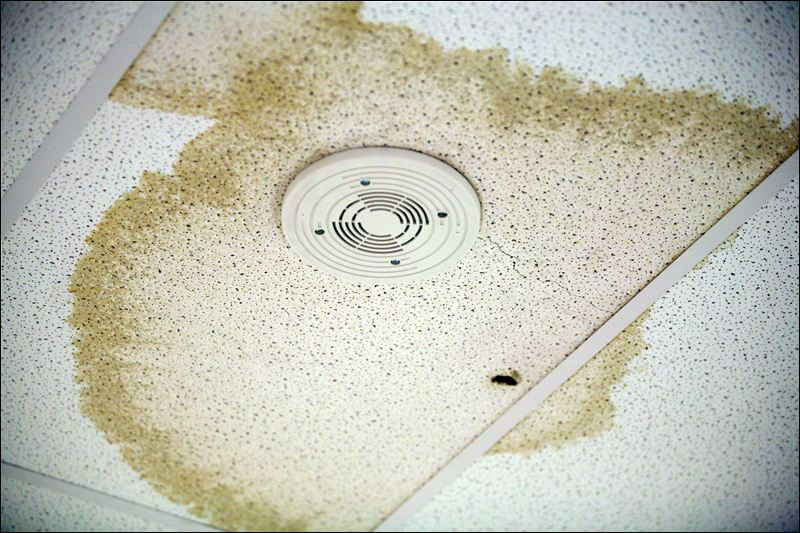 The ceiling or walls may show visible signs of moisture, dripping water, or cracked ceiling. Ceiling drywall panels may sag or crumble under the weight of water that saturates the naturally porous gypsum. Other times you might notice tiny signals, such as coffee-colored stains that expand over time Prior to making any repairs, you need to find the origin of the water leak. This can be frustrating, but there’s no point repairing damaged areas until the leak is found. Whether it’s a leaky roof, a broken pipe or leaking toilet, it can sometimes be difficult to find the source. Water can travel far from the source and cause harm somewhere you wouldn’t expect it. This usually means you’ve got to do some exploration and investigation. Remove damaged drywall so you can better see where the flow is coming from (see Step 2), and so that you may dry out the water-damaged area. Depending on the length of time the water has been leaking unchecked, there may be mould present in or on the drywall. Some mould – for example “black mold” – is better off remediated by specialists because it may be very toxic when present in large quantities. If you do have substantial amounts of mould throughout an interior area — anywhere around 90 sq. cm. — call a professional to have it eliminated. If only a small amount of mould is present, it’s possible to safely remove the mould or the affected drywall yourself if you take precautions. Wear gloves, safety goggles and a dust mask so that you don’t breathe in the mould spores. In some serious cases where there is acute water damage, you may need to call in a professional ceiling contractor Perth to repair the origin of the leak, or to repair the damaged ceiling or walls. Before beginning, put down drop cloths or tarps to capture all the drywall pieces, dust and debris created when removing the damaged material. Check the drywall to learn how much harm has been done. Heavily water-infiltrated wallboard will sag from ceilings or crumble to the touch. Remove all damaged drywall by hand or use the claw end of a hammer or a wrecking bar to remove it. If drywall panels just show water stains but are not structurally compromised, they may be repairable by cutting out the damaged portion. When cutting around the damaged area, use a keyhole saw to cut the gap into a square or rectangular form. You can then make a patch with a different piece of drywall for the repair. When cutting out or removing the damaged drywall, wear safety goggles and a dust mask for protection. If you are patching the wall or ceiling, assess the square or rectangular area of the wall which you cut out from Step 2. Use these dimensions to cut out a replacement piece of drywall to fit – about 50mm longer and 50mm wider than the actual hole. Lay the replacement piece of drywall on a level surface with the backside facing upward. Quantify in 25mm from all four edges and then draw a line using a pencil. This will form a contour the size of the hole. Using a straight edge and utility knife, cut through the backside paper as well as the drywall gypsum, but not the front-facing layer of paper. With a putty knife, peel off only the back paper and gypsum layer. Be careful not to rip the front-facing paper. If the patch is not a perfect fit, remove it from the hole and trim to size with a utility knife. Holes bigger than 150mm and up to 300mm need a slightly different procedure because the patch needs more support. With a drill, create two small holes through the piece of replacement plank. Feed a piece of string through and tie both ends to the middle of a stick. Allow for about 200 mm of slack between the board and the rod. The “stick side” of the board will be the front. The stick will be used to hold the patch in place. Twist the stick to apply pressure to the back of the board. This will steady it in the hole. Apply a smooth coat of cement adhesive around the edges. Insert the patch into the hole and place it so the cement glue firmly grips the good area around the rear of the pit. Twist the rod clockwise, twisting the string and increasing pressure against the patch board at the rear of the pit. This will hold the board firmly in place until the cement glue dries. To make it easier to fit the wallboard fabric through the hole, be sure to hold it at an angle. If you are working with a bigger hole (up to 150mm), use a thin layer of joint compound around the hole. Place your patch onto the hole. With a putty knife, work the paper border down to the compound. Feather the edges and allow it to dry. Sand lightly with fine-grade sandpaper and apply a second layer of joint compound to complete the repair. For bigger holes (between 150mm and 300mm), allow the cement glue to completely dry before filling the region with joint compound. Smooth out the region, then let the patch dry thoroughly. You might want to apply two or three layers of joint compound to further develop the patched area. Always allow each layer to dry before applying the next. Leave the stick and string where they are during the patching process. You can remove both just before the material dries. Damaged areas bigger than 77 square cm may require a complete replacement panel since large pieces of drywall have to be anchored to wall studs or ceiling joists. It depends where the damage is located on the wall or ceiling and how you need to cut it out. For instance, if the space where you removed the damaged drywall exposes studs or joists, it will be possible to fasten a patch by simply putting it into the stud or joist. Otherwise, you may need to replace the whole drywall panel. To replace the whole sheet, remove the damaged drywall completely, right down to the studs. Using a drill, remove the drywall screws which anchored the old sheet to the studs. If there was lots of water damage, this should be fairly easy. The older drywall will probably just crumble away. Measure the height and width of the space you are repairing so that you know how much new wallboard you need. If you need custom-sized panels for an irregularly shaped repair, use your measurements to cut a patch to fit with a utility knife or drywall saw. Align your new panel together with the wall studs and then fasten the panel into the studs with drywall screws and a power driver. Use joint tape to cover the seams where every panel meets. Apply joint compound over the tape using a putty knife. Let it dry according to manufacturer specifications, then sand the compound with fine-grade sandpaper until the new sheets are flush with the drywall panels. Make sure you have someone to help you if you’re putting in complete drywall panels or working on ceiling fixes. Drywall can be heavy, and attempting to keep it stable when fastening it in place can be challenging. Be sure to cover the entire surface of the wall. Open windows to make sure you are painting in a well-ventilated area. Pour True Worth Ultra Premium Interior Paint into a paint tray and then coat your roller or paintbrush. Paint roller should be 1800mm. Apply paint or primer in square sections with a zigzag pattern of overlapping “W” strokes. To ensure even coverage, use light strokes as you re-roll the ceiling or walls, and cut in with the brush around the edges. Using a small, angular paintbrush, cover locations where your roller can’t reach, like the corners and adjacent to doors, windows and molding. If needed, apply another coat of paint using the same technique as the first coat. You don’t need to let the paint totally dry between coats, however, your results will be better the longer you wait. Use a shop vacuum to clean up dust and debris. Dispose of used paint cans appropriately. Cleaning paintbrushes and other equipment is made simple with warm water. Gently wash your roller brushes and covers in water till the water runs clear. If you have one, then place them in a brush/roller spinner to remove excess liquid. Replace in their own protective sleeves or hang them on pins or nails. Pick up drop cloths carefully, making sure not to spread any paint around that might have gotten on them. Remove painter’s tape at a 45-degree angle to prevent damaging any fresh paint. Bear in mind that the longer it remains on, the harder it is to remove. Great job! You have sourced the leak and repaired the water damaged areas.